"Your support has more than exceeded my expectations and I look forward to recommending your services to other friends and family that plan on tying the knot in the near future." "I think it is a fabulous, fun,and smart site. I like that fact that even though people are just giving you money which many people don't like to do, it is actually more personalized than that. I love that they can look at gifts you want and be able to contribute to that particular gift, and be able to feel part of you achieving your goal of getting that gift ... your website is great for weddings because newlyweds don't have to worry about physical gifts or large sums of money floating around. 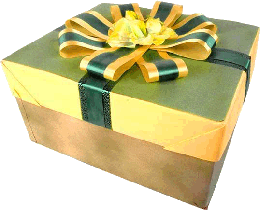 And your website is great in general because you don't have to worry about getting or giving duplicate gifts." "It was and continues to be fantastic! Thanks for all the templates and ideas for creating our special page"
"I thought the experience of selecting from the registry, opening the account, and paying for purchases was very simple and sweat-free. Very clever idea for selecting gifts in this busy day and age." "I was going to develop a quick webpage myself but thought there must be something out there already. "When we decided to get married, my first impulse was to say "No gifts, please" on our invitations. We've been living together for a few years and we already have a houseful of everything we need. Several close friends, however, convinced us that people really want to celebrate the occasion by giving, and if they didn't have something to clue them in I could expect to receive a plethora of silver trays. So we decided to fill our registry with items that would help us in the move to our new house. When I discovered your website, I knew I'd found the perfect place to register. I loved the idea of listing the things we really need, from paint and a lawn mower to a new cat door and a future restoration project. And better yet, I could customize the list with my own photos and descriptions. The features on the website allowed us to have fun and I know it will make "shopping" a more personal experience for our friends and family. And the good feedback is already coming in. Thank you for making a process that initially felt so uncomfortable turn out to be a really fun experience!" I’ve contributed to numerous gift registries in the past- but none as simple and straightforward as your website. Best of all, your team was extremely helpful, friendly and responsive. If you have an upcoming event, don’t waste your time looking for another service, this website is the way to go!" Registry: Bradley & Michael Are Getting Married! "I've found your website to be the most convenient, easy to use online registry available. The support team are quick to respond to any queries and friendly to speak with. I’ll be recommending your website to my friends & family with no hesitation." "Your service was convenient, especially because the couple I gave a gift through your website can probably use money more than some random (even if well-intentioned) gift. I would not usually be comfortable giving money as a gift, but this service makes it an acceptable and appropriate gift." "I like the idea that my shopping is now done for the couple who registered with your website. Only took about 5 or 10 minutes!" "This is the first time I've experienced using the site, and as a guest of a wedding. It really does take the pressure out of having to choose a gift and to physically go and purchase something, wrap it and take it along to the wedding. And the practicality of knowing that the happy couple are getting what they 'wish for', makes it most welcome to me. What a great idea ... it's a fantastic site and so user friendly. I got through all the steps with no problems at all. Well done for a fantastic and most practical solution for all of us – the happy couple, their families and the guests! "I think your website is a great idea in the modern day of weddings! Most couples don't need a ton on stuff and cash gifts would be much better utilized. It gives couples a legitimate and elegant way to ask their guests for cash!